If you like crosswords, but are looking for an even tougher challenge, then have you ever considered tackling the puzzle that is a skeleton crossword? 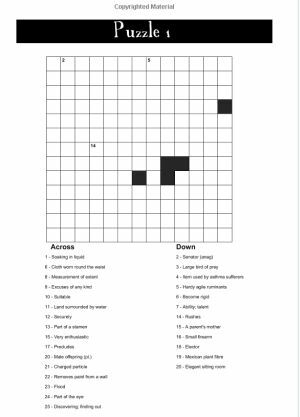 With this puzzle not only are you required to solve a crossword, but you are also required to work out the crossword grid itself too! At the start of the puzzle you will be given a few scraps of information: a few numbers in the grid corresponding to certain across and down clues, and a few squares too - but the rest is up to you. Armed with the clues alone you will need to work out the grid pattern and the solution to the puzzle. Each of these 50 puzzles has a symmetrical grid, so it is important to use this in order to help deduce the shape of the grid and make progress working out the grid and thus helping to work out the answer to the puzzle too. Things are tricky as the clue lengths aren't given, so you'll need to work those out too in order to make a valid symmetrical crossword grid. Of course, we do give you the clues! 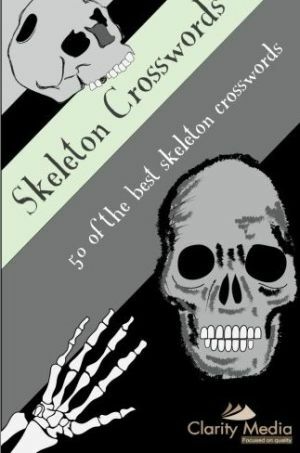 There are 50 skeleton crosswords in this brand new book with all new puzzles, and the grid pattern for each of the puzzles is different so you'll be provided with a unique crossword and a unique challenge to work out the grid shape for every one of these puzzles. We hope you enjoy the challenge that is posed by these skeleton puzzles - if you can complete them all, then you truly are a crossword master. The puzzles use British English, so for our American friends please note occasionally words may have a different spelling to you are used to: eg 'colour' as opposed to 'color' and so forth.